That’s a lot of ground to cover, and when you take into account that The Broad’s collection spans some 2,000 works of art, it’s easy to see why a visitor might feel overwhelmed. Fear not, though, newcomers. Today, we’re going to provide you with all the information you need to make the most out of your inaugural visit to one of DTLA’s most impressive museums. We’ll start by getting the general information and descriptions out of the way. The Broad is, at its core, a contemporary art museum. 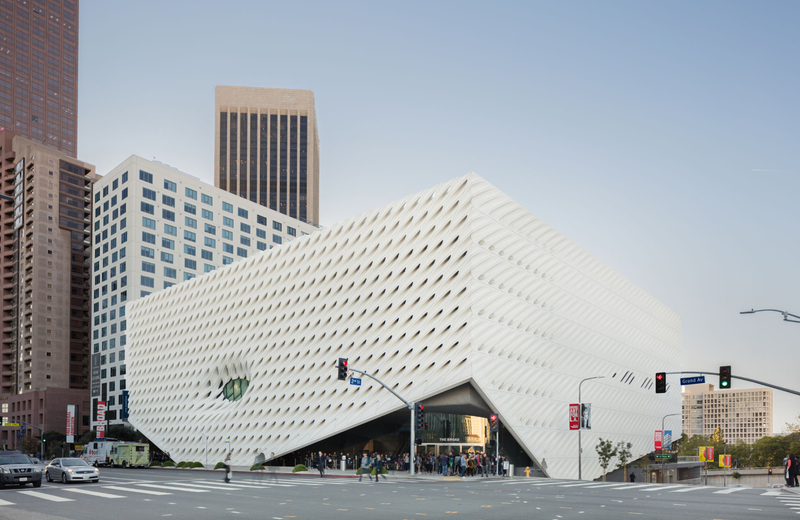 It was founded by Eli and Edythe Broad, designed by Diller Scofidio + Renfro in collaboration with Gensler, and opened in September of 2015. We’ll discuss some specifics of the collection later, but know that the art here brings together a selection amassed from more than 200 artists worldwide. So, not content on their laurels, you’ll find that they are engaged in a perpetual quest to make The Broad better, which, we might add, is no easy feat. Just a glance at the building reveals the thought and care that was put into its creation, as well as the planning that ensured this space would provide for the optimal viewing space. Any Tips for First-Time Visitors? Preparation is the key to optimizing your experience, so be sure to follow some of these tips to better your chances of having a great time when you visit The Broad. Entry might be free, but that doesn’t mean you won’t need a ticket to get inside. The Broad is a popular place, and while it’s no certainty that it will be filled to capacity on the date of your choosing, it’s also best not to take chances. Thankfully, acquiring tickets isn’t an overly-complicated task. You can reserve a slot on The Broad’s general admission page, which will also give you an idea of when timed tickets are released. Beyond that, visitors can make use of the app to reserve tickets and help navigate the vast collection. As for those special audio tours, they’re narrated by various art notables, the museum founders Eli and Edythe Broad, and the inimitable LeVar Burton, former host of Reading Rainbow and popular education advocate. Now, you could in close proximity to The Broad and drop a good deal of money on parking. A wiser approach, however, would be to park a block (or few) away to help save yourself a few dollars. The on-site garage cost $15 for three hours — a hefty fee by just about any standard. Finding yourself another place to park, though, will save you the trouble of cramming into the garage and give you the benefit of logging a few extra steps on your trip. The Broad has three floors packed with gorgeous artwork. The best way to view it, in our opinion, is to start high and gradually descend the museum. You can follow the guided audio tours (courtesy of that companion app you already downloaded) or head straight for some of the museums main points of interest. The exhibition, which opens June 30th, will feature works from more than 20 artists, including Bernd and Hilla Becher, Gregory Crewdson, Andreas Gursky, Elliott Hundley, Pierre Huyghe, Anselm Kiefer, Sherrie Levine, Glenn Ligon, Sharon Lockhart, Paul Pfeiffer and Ed Ruscha. There’s plenty more to check out, of course, so be sure to reserve your time slot at The Broad today and get down there soon. Especially when those luxury apartments are places like Eighth & Grand. Tucked away in one of the most desirable portions of Los Angeles’ rapidly evolving downtown, this amazing building is a sight to behold, and so much more. Inside, residents enjoy a higher standard, marked by some of the most impressive comforts and conveniences you’ll find anywhere in the city. Why settle for less? Give Eighth & Grand a closer look today.